Have you seen the new craze? Forget Pokemon, the Kate and William Royal Wedding sticker albums, baseball, tea and bubblegum cards. It’s official! Romance Trading Cards are all the rage now. They are even being taken to World Romance Writers conferences and RomComs. 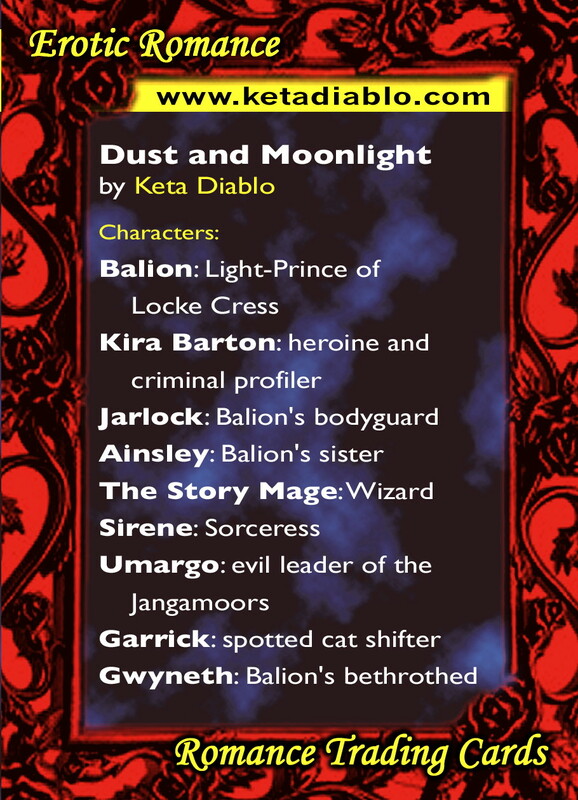 Readers are printing them out like crazy in a drooling frenzy trying to collect them all. What do you think of them? These have been designed with the RTC’s logo, but really anything goes if you are creative enough. 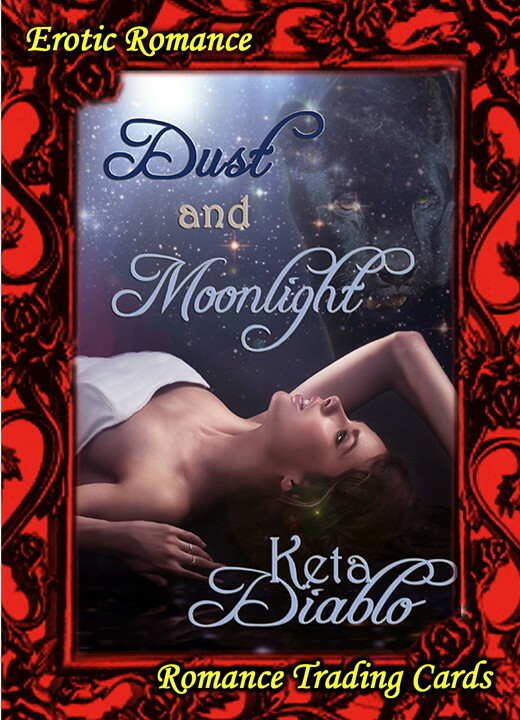 It’s amazing how these little beauties really have caught on and I am delighted to be able to show you some created for Keta Diablo’s latest new release ~ Dust and Moonlight, which is already receiving rave reviews. Balion, Prince of Locke Cress, waited a long time for the forest nymph with lavender eyes to come to him. The dreams told him it was just a matter of time. What they hadn’t told him was that he’d lose his heart to the strange creature from another world. 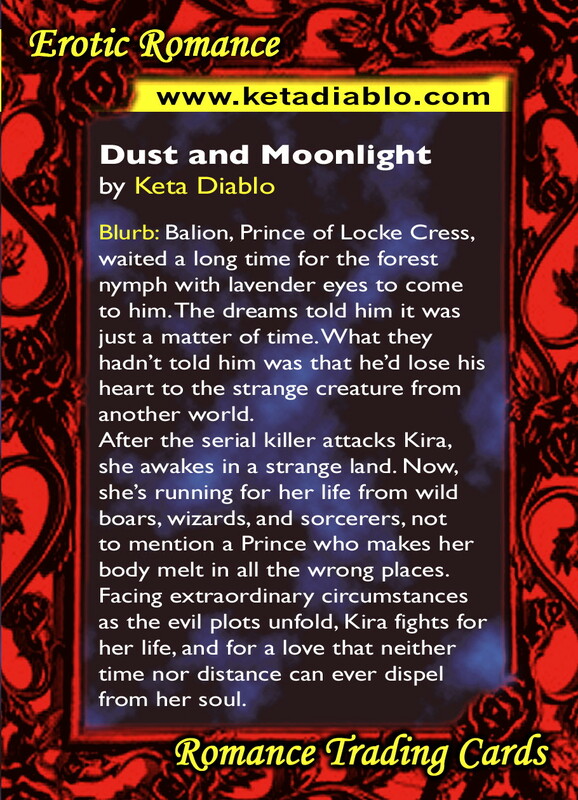 After the serial killer attacks Kira, she awakes in a strange land. Now, she’s running for her life from wild boars, wizards, and sorcerers, not to mention a Prince that makes her body melt in all the wrong places. Facing extraordinary circumstances as the evil plots unfold, Kira fights for her life, and for a love that neither time nor distance can ever dispel from her soul. Want to find out more about RTC’s? Check out the RTC site. You can do create and upload them yourself for free. If you are not technically minded or don’t have the time, you can get someone else to do them. (*Me* LOL) by enquiring through this email address: MediaCrickets@gmail.com a new promo company I have co-founded with another author and publicist. We’re not officially open yet, but we are already building up a client list with orders from RTC cards to newsletter and Twitter management. In fact, the response to our new venture has been out of this world. Thank you!